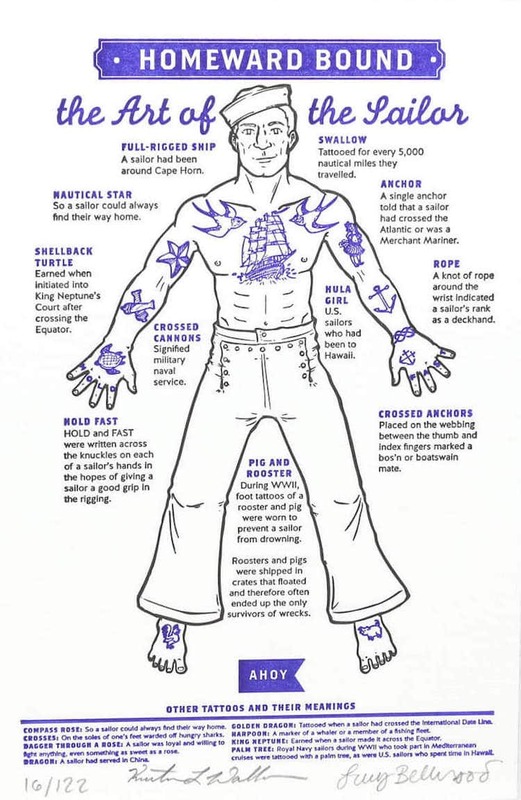 Have you ever wondered what traditional sailor tattoos mean? With a helpful illustration by “Adventure Cartoonist” Lucy Bellwood, you can now decode what the diving swallows, crossed anchors, and nautical stars mean. She’s created The Sailor’s Art, a diagram depicting a tattooed sea traveler whose body art is named as well as defined. The symbols tell the stories of travels made along the open water from the hands of the sailor to his feet. For example, a swallow represents 5,000 traveled nautical miles, whereas a hula girl means a U.S. sea man who has been to Hawaii. There are also tattoos to bring good luck. Having the words Hold and Fast inked across the knuckles is done in hopes of a tight grip in rigging, whereas a nautical star is so they can always find their way home.